The program includes government-issued digital identification and gives holders the right to start and run a virtual business in Estonia. Like many European countries, Estonia faces a falling fertility rate and the economic pressures that come with it. A bright spot, however, is its e-resident program, which has resulted in virtual residents growing faster than the Baltic country’s real-life, native-born population. 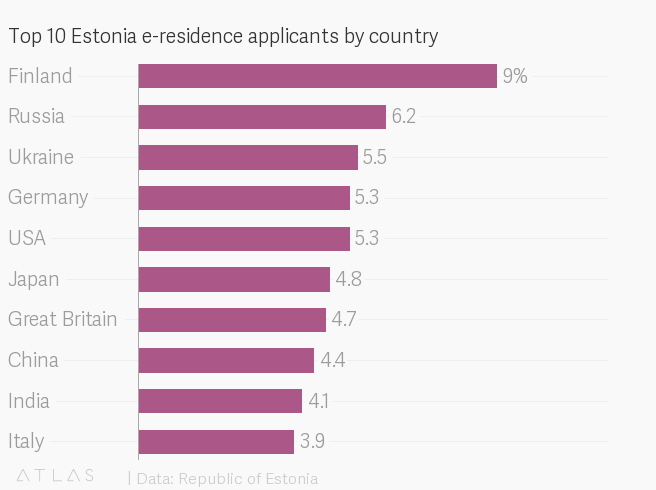 In 2014, Estonia started offering e-residencies, available to anyone in the world. The program includes government-issued digital identification and gives holders the right to start and run a virtual business in Estonia. Digital nomads can get access to bank accounts and payment services, while having a physical presence in Estonia is optional. It’s not citizenship, however, and e-residents still have to pay taxes where they are physically based. Sikkut says the electronic systems, which include things like digital signatures, make bureaucracy more efficient, saving money for entrepreneurs and the government. Voting has also been digitized, which gives Estonians the leeway to change their votes if they make a mistake. Russia, Ukraine, Japan, and the US are among the biggest sources of applicants for e-residency, which gives entrepreneurs access to the European Union’s single market. Even Japanese prime minister Shinzo Abe has signed up. However, Finland and Germany are also at or near the top of the list of source countries for e-residents, which suggests there’s more to it than EU market access. For some people it could be novelty, tinged with optimism about more openness and fewer borders. Some 41% who apply say they’re running international businesses that are independent of any particular geography, while 14% report simply being a “fan of e-residency.” The biggest age cohort for applications comes from people who are 31 to 40, and 88% are male. Estonia’s population of 1.3 million makes it one of Europe’s smallest by that measure. So the republic, which attained independence from the Soviet Union in 1991, has for decades looked to outpace the rest of the world when it comes to digitizing its economy. The government has backed investment in internet broadband service, for example, and students in the country’s schools start to learn coding at age 7. Skype, which launched in 2003 and scooped up 1 million users in its first month, has its roots there. Estonia’s e-residency program, which has grown to around 45,000 people, is still small: it’s about the same size as the number of people who show up every five years in Tallinn to sing folk music at the national Song Festival. But Sikkut says the seemingly modest number still makes a difference for a country of Estonia’s scale. While the virtual e-residents don’t generate tax revenue directly, domestic businesses end up providing things like financial services or virtual offices. He says the program has successfully added jobs to the Estonian economy, and the additional revenue created already exceeds the money the government invested in it.